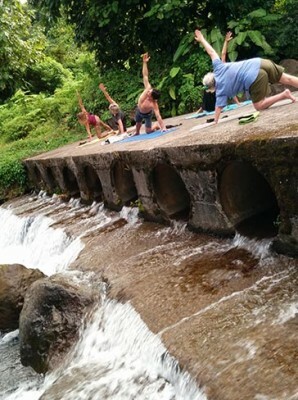 We have just returned from our first wellness retreat on the Caribbean island of Dominica, a retreat that blended various forms and practices of wellness with insightful local interactions. It was a truly magical cultural exchange and a rewarding experience for all! Some unforgettable memories include: learning about island nutrition from Sybil and enjoying the most amazing meal (I can still taste that plantain stuffed with salt cod); walking through Dawn’s organic farm to hear the passion, knowledge and love she has for organic farming and educating the people on the island; getting to meet Daniel as he took us through the process of making cassava bread from the root to the table; and of course, the yoga sessions held in a stunning natural environment, meditation and movement next to sparkling river pools, and massages under a cascading waterfall. 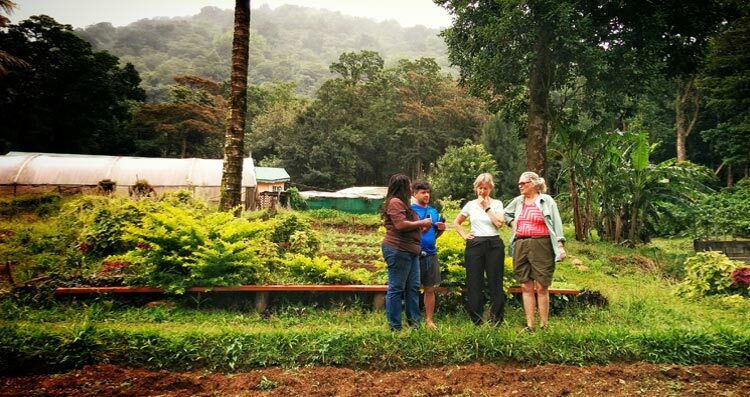 Our retreat started on the northeast side of Dominica where we met with Sybil, a nutritionist who loves to cook healthy meals using organic produce and local seasonal spices. 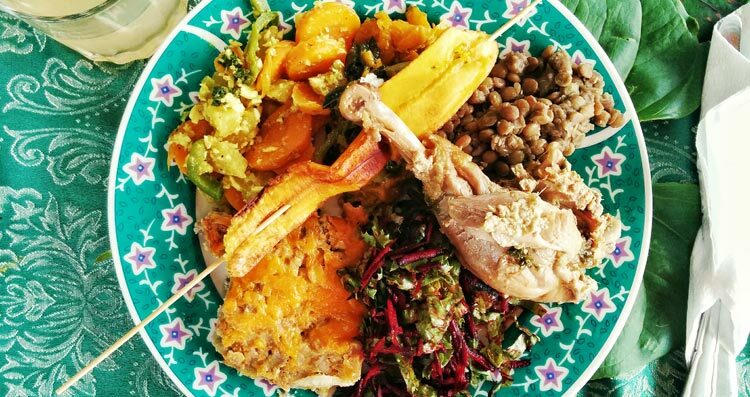 After we were introduced to an array of native tropical fruits, vegetables and spices, we learned some unique techniques for integrating good nutrition without sacrificing taste. The highlight of the day was getting to roll up our sleeves for a cooking class to make jerked chicken over a delicious soft roasted breadfruit. After spending a couple of nights in the north, we headed south for a stop in the Kalinago territory where we met with Daniel and his family who showed us how to make cassava bread. Daniel has worked hard to preserve the ancient traditions of cassava bread preparation into modern times. We followed along the many steps from digging the root from the ground to washing, grating, pressing, separating, drying and baking the bread over a cooktop that Daniel designed, and finally, eating it. Hot off the cooktop, the cassava bread has a subtle, nutty flavor complemented by coconut and raisins — an incredible crispy texture on the outside but with a soft center. Later, when we arrived at Rosalie, Trudy led the most amazing Yoga session of my life. Not only was the setting spot-on (located in the center of a bridge over a picturesque river in the heart of the rainforest), her impressive knowledge and instructions were second to none. The combination of the natural setting and the inspirational teachings made for the perfect closing to Day Three. The following day we headed to Zion Valley in the heart of the rainforest south of Rosalie to meet with the local bush doctor Moses and his partner, Ingmari. 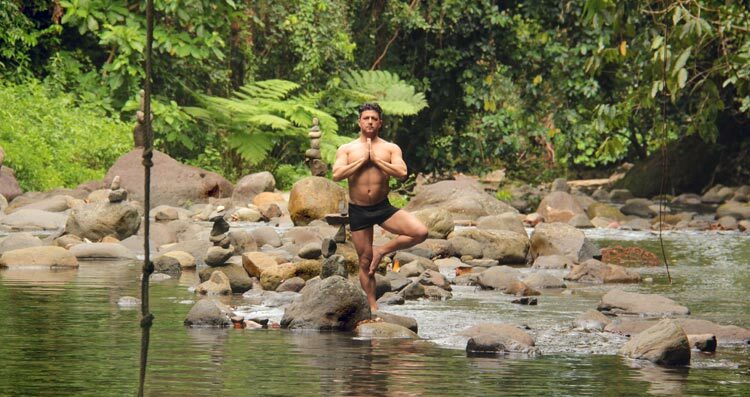 It was a unique way to experience how the locals live and embrace the concept of wellness. I was lucky enough to be there on the day that a soursop fruit fell off the tree as I walked by. It was the first of the season and happens to be one of my favorite fruits. After a delicious “one pot” lunch, Moses gathered a few anti-inflammatory herbs and prepared a treatment for my eye (I had been suffering from a sty infection since I left home). Ingmari led a wonderful multi-sensory meditation session on the banks of the White River. In the afternoon we headed to the fabulous Jungle Bay, a resort perched on a cliff overlooking the Atlantic Ocean. There we met Sam, the owner and toured the facility before Nancy led a Yoga session in a beautiful studio overlooking the ocean. On day five,we met with Dawn for a truly inspiring and insightful visit of her organic farm. 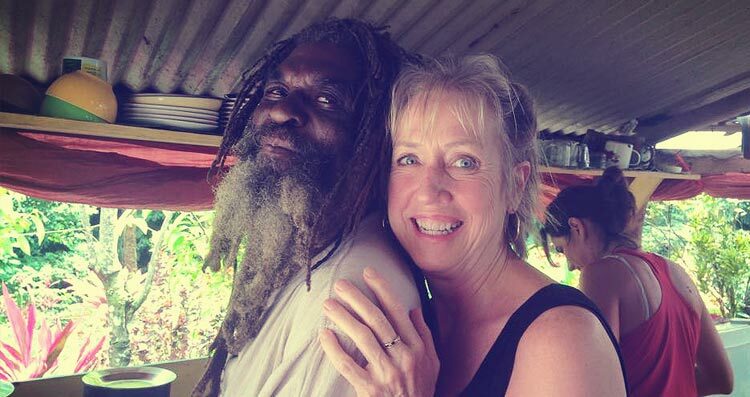 Dawn shared her passion with us for organic farming and educating children on the island to follow in her footsteps. We learned about trees, plants and fruits that the locals use, not only for cooking, but also for medicinal purposes. Our clients then had the chance to plant seeds for beet starters and make coconut oil before sharing a fantastic lunch made entirely with fresh produce from Dawn’s farm. The following day, Tana, one of the best guides on the island took us on a tour and stopped at a friend’s fruit and veggies stand where we bought several local spices, cocoa sticks, coffee, and tasted some delectable fresh fruits. This unplanned stop was not only fun, it was educational. 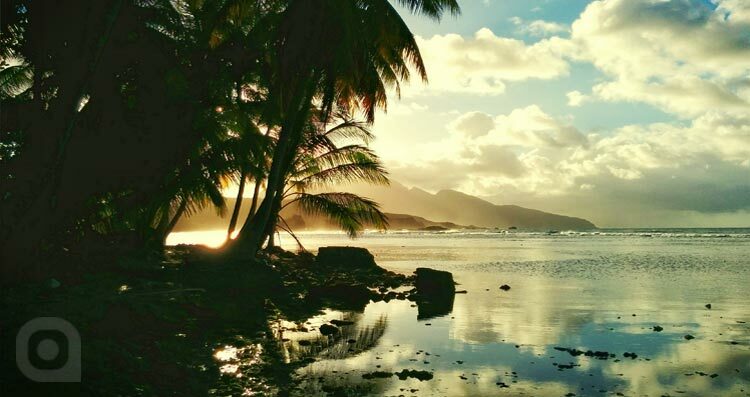 On the final leg of our wellness retreat, we got to relax for a couple of days on the Caribbean side of Dominica in Roseau. We stayed at Papillote where they have the most beautiful garden on the island and access to hot sulfur pools and waterfalls. Needless to say, our days started early with a relaxing bath in the hot sulfur pools and a natural massage under a waterfall, surrounded by the most incredible flowers, a thick, luscious rainforest canopy and an orchestra of singing birds welcoming the sunrise. Our relaxing week came at last to an end as we reflected on where we were when we arrived and what we learned during the course of those seven incredible interactive days. We would never have been able to do it without the collaboration of our Locals and for that we are truly thankful. We are energized from this experience and excited to start planning our next retreat in November! We hope you are inspired to join us.